As befits an actress defending a stage by herself, Charlayne Woodard has a full arsenal of high-voltage facial expressions, looks specifically programmed to melt frozen audiences. But the one that probably serves her best at the Manhattan Theater Club, where her ''In Real Life'' opened last night, is a smile that mocks itself. It is a grin, to be exact, a gigantic grin in which every flashing tooth seems to glimmer with dopey confidence. Every time Ms. Woodard pastes on that grin, evoking the girl she was some 20 years ago, there is a glint in her eyes that asks: ''Can you believe I was ever this young? That anyone was ever this young?'' This in no way detracts from the smile's alarming charm. 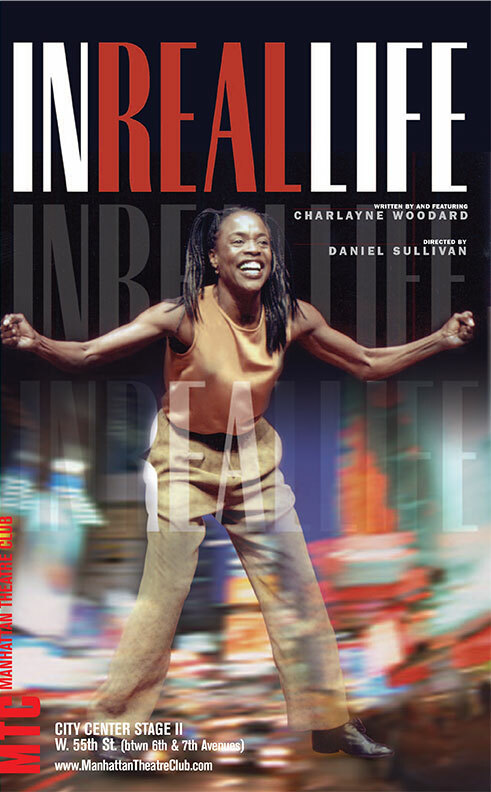 ''In Real Life,'' the third of Ms. Woodard's autobiographical plays (''Pretty Fire,'' ''Neat''), is a wondering tribute to this electrified callowness, which she brought with her, along with a violin named Josephine and five memorized monologues, when she came to Manhattan in the 1970's. It was a trait that helped land her a plum role in -- and a Tony nomination for -- ''Ain't Misbehavin','' the hit Broadway musical devoted to the songs of Fats Waller. When Ms. Woodard recreates her audition for the revue, singing ''Auld Lang Syne'' a cappella with the careless arrogance of someone who has better things to do, you understand exactly why she got the part. You may have gathered that ''In Real Life,'' which is directed by the ever-smooth Daniel Sullivan, falls squarely into a much beloved tradition in theater lore: the tale of a wide-eyed but ambitious creature who hits the big city fresh from the provinces (in this case Albany) with a headful of dreams and a conquering dewiness. The story has been told in plays and movies (''Stage Door,'' ''Morning Glory''), musicals (''42nd Street'') and even television sitcoms. (Remember ''That Girl''?) Ms. Woodard doesn't cheat on the satisfying conventions of the genre, from the heartbreak of early rejection to the triumph of opening night. But she also offers some piquant variations on the theme. But it was peppy, all-black musicals like ''The Wiz'' that were the Broadway flavor du jour. The young Ms. Woodard, who considered herself a supremely serious actress, wanted no part of such lightweight, eager-to-please entertainments. ''In Real Life'' cannily chronicles her initial seduction into the thrills of stopping a show and the physical and emotional price of sustaining the energy to do so night after night. Central to her initiation were her fellow performers in ''Misbehavin','' who fortunately included the eminently imitable Andre De Shields and Nell Carter. Ms. Woodard impersonates them with the same affection and mercilessness she brings to embodying her younger self. There is, in particular, a priceless sequence in which Ms. Woodard is distracted during a solo number by the sound of Ms. Carter sharing a bucket of chicken wings with the musicians. Ms. Woodard also incarnates, with glee and respect, her tirelessly supportive boyfriend, her woefully unimpressed parents, a nightclub diva of a mentor and a charismatic Jamaican named Winston, whose descent into drugs runs parallel with Ms. Woodard's climb to success. Ms. Woodard is a natural writer, with an ear for the evocative detail. Under Mr. Sullivan's direction ''In Real Life'' has been buffed to a high professional sheen, with John Lee Beatty's stylishly stark red set brought to remarkably varied life by Kathy A. Perkins's lighting. It is, however, Ms. Woodard's particular luminousness, as she resurrects a girl who wanted to be a star, that lends newly infectious vitality to an enduring cliché. Written and performed by Charlayne Woodard; directed by Daniel Sullivan; sets by John Lee Beatty; costumes by James Berton Harris; lighting by Kathy A. Perkins; sound by Chris Walker; original music by Daryl Waters; production stage manager, Denise Yaney. Production manager/director of capital projects, Michael R. Moody; associate artistic director, James Pentecost; general manager, Harold Wolpert. Presented by the Manhattan Theater Club, Lynne Meadow, artistic director; Barry Grove, executive producer; in association with the Mark Taper Forum. At City Center, Stage II, 131 West 55th Street, Manhattan.